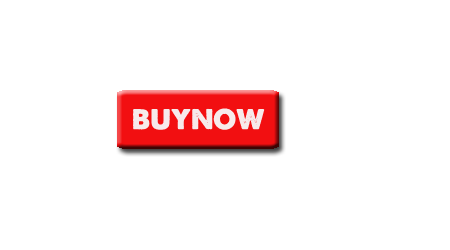 Since ancient times Indian Textile industry has been well known for her textile goods. During the colonial regime the traditional textile industry of India was virtually decayed. However, in the early nineteenth century the modern textile industry took birth in India when the first textile mill was established at Fort Gloster near Calcutta in 1818. Next to Agriculture India mainly is into the Textile Sector. Indian Textile Industry is one of India's oldest industries and has a formidable presence in the national economy as it contributes to about 14% of manufacturing value-addition, accounts for around one-third of our gross export earnings and provides gainful employment to millions of people. In 1850's the cotton textile industry, however, made its real beginning in Bombay.In the year 1854 the first cotton textile mill of Bombay was established by a Parsi cotton merchant then engaged in overseas and internal trade. Indeed, the vast majority of the early mills were the handiwork of Parsi merchants engaged in yarn and cloth trade at home and Chinese and African markets. The first cotton mill established in the year 1861 was at Ahmedabad, which was eventually to emerge as a rival centre to Bombay, which later spread the textile industry largely due to the Gujarati trading class. The cotton textile industry made rapid progress in the second half of the nineteenth century and by the end of the century there were 178 cotton textile mills; but during the year 1900 the cotton textile industry was in bad state due to the great famine and a number of mills of Bombay and Ahmedabad were to be closed down for long periods. Today most of the international brands like Marks & Spencer, JC penny, Gap have started procuring most of their fabrics from India. In fact, Wal-Mart, who had procured textile worth $ 200 million last few year, intends to procure $ 3 billion worth of textile in the years to follow. Of the Indian textile yarn exports, almost 80 percent come from coarser yarns (counts below 40's). Consequently, there is a need to upgrade the technology. The domestic knitting industry is characterized by small scale units with facilities for dyeing, processing and finishing. The industry is concentrated in Tirupur (Tamilnadu) and Ludhiana (Punjab). Tirupur produces 60 percent of the country's total knitwear exports. Knitted garments account for almost 32 percent of all exported garments. The major players include Nahar Spinning, Arun Processors and Jersey India. 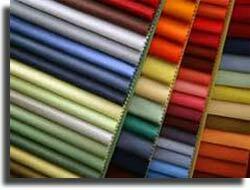 Indian textile industry is one of largest Industries in Indian Economy. In 2000-01, the textile and garment industries accounted for about 4% of GDP, 14%of industrial output, 18% of industrial employment and 27% of export earnings. Indian textile industry is significant in global context also, ranking second to China in the production of both cotton yarn and fabric and fifth in the production of synthetic fibers and yarns. The Indian textile industry constitutes 14% to industrial production, 4% to the country's gross domestic product (GDP) and 17% to the country's export earnings, according to the Annual Report 2009-10 of the Ministry of Textiles. According to the Indian Ministry of Textiles, the cumulative production of cloth during April'09-March'10 has increased by 8.3 % when compared to the same period of the previous year. The total Indian textile exports have increased to US$ 18.6 billion during April'09-January'10, from US$ 17.7 billion during the same period of the previous year, registering an increase of 4.95 % in rupee terms. Gradually the share of textile exports in total exports has increased to 12.36% during April'09-January'10, as per the Ministry of Textiles. During April-March 2009-10 textiles has registered a growth of 5.5% according to the Index of Industrial Production the data released by the Central Statistical Organization (CSO). Cotton, white wool, silk and man-made fibre textiles have registered a growth of 8.2 % while textile products including apparel have earned a growth of 8.5%. 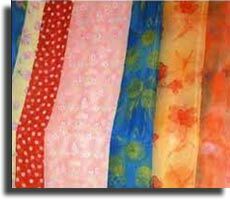 Some of the reputed names in the Textile companies in India are: Raymonds, Arvind Mills, Reliance Textiles, Vardhaman Spinning, Welspun India, Morarjee Mills, Century Textiles, Ginni Filaments Ltd, Mafatlal Textiles, S. Kumar Synfabs, Bombay Dyeing Ltd, BSL Ltd, Banswara Syntex, Grasim Industries, Oswal Knit India, Fabindia, Laksmi Mills, National Rayon Corp, Mysore Silk Factory and many more. The Indian Textile Industry of India is vast and growing with presence of several national and international brands. 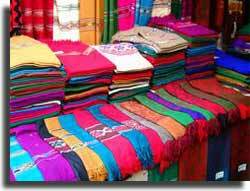 The main segments of the Indian textile industry are Man-made Textiles, Cotton Textiles including Handlooms, Silk Textiles, Woolen Textiles, Handicrafts, Coir, Readymade Garments, and Jute. Job opportunities are diverse in nature in the textile industry ranging from production, designing, distribution and sales. The need for manpower for the textile industry is growing to keep up with the growing demand; freshers are finding numerous job opportunities in the textile industry of India. The Indian textile industry offers opportunities to fresher's from various academic backgrounds as nature of job is diverse. A textile engineer must have an engineering background; either B.E. or B.Tech is preferred. The industry considers even the textile diploma for jobs. One more interesting demand for textile industry is the textile faculties which are in rise, for which a post graduate degree is mandatory. Textile sales executives is another opportunities required by the apparel stores where graduates are recruited from all disciplines. Textile designing requires the Knowledge of softwares like Photoshop, Corel Draw, etc. Indian Textile Industry comes under the category of 'Orange' which represents marginally polluting units. Indian Textile Industry is known to be the 3rd largest manufacturer of cotton across the globe. Around US$ 5.35 billion of foreign investment is expected to be made in India in the textile sector over the next five years.The textiles industry has attracted foreign direct investment (FDI) worth US$ 817.26 million between April 2000 and March 2010, according to data released by the Department of Industrial Policy and Promotion. S Kumars Nationwide has formed a joint venture (JV) with Donna Karan International to design, produce and distribute the entire range of DKNY menswear apparel across the world except Japan for 10 years. The new venture will invest US$ 25 million for expansion of Donna Karan's menswear brand and expects to record sales of about US$ 140 million in the next three years. The Andhra Pradesh government has allocated over 1000 acres of land for the Brandix India Apparel City (BIAC) in the state's special economic zone (SEZ), which was inaugurated in May 2010. The apparel city is expected to attract an investment of US$ 1.2 billion (around Rs 5,400 crore). Private equity firms TPG and Bain Capital have picked up stakes in children apparel retailer Lilliput Kidswear for US$ 27 million and US$ 60.7 million respectively. Italian sportswear maker Lotto is planning to invest US$ 10 million over the next five years to capture 7 % of India's branded sports apparel and equipment market. This brand started its stand-alone retail chain in India in the year 2008, has 31 stand-alone stores across the country and plans to open 200 more such stores by 2015. World's leading lingerie brand, Germany-based, Triumph International, plans to invest over US$ 217 million in India to open 12 more flagship outlets and 30 additional EPS (Exclusive Partner Stores) during 2010.